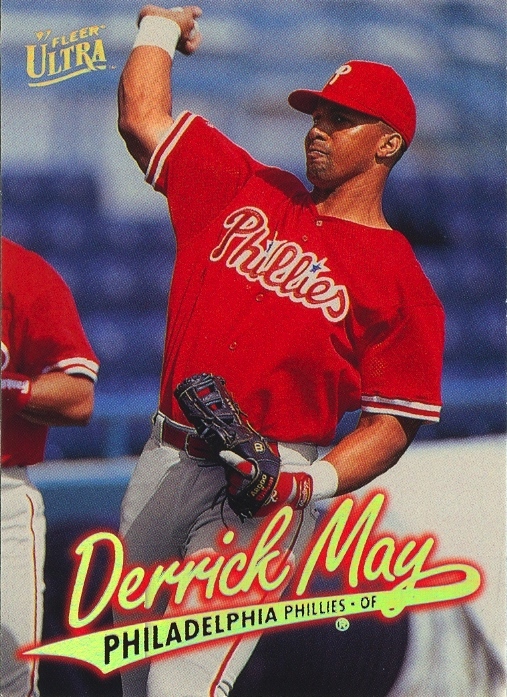 Featured cards: 1992 Leaf #330 Mickey Morandini; 1992 Leaf Black Gold Edition #330, Mickey Morandini; 1997 Fleer Ultra #476, Derrick May; 1997 Fleer Ultra Gold Medallion Edition #476, Derrick May; 1997 Flair Showcase Row 2 # 168, Wendell Magee, Jr.; 1997 Flair Showcase Legacy Row 2 #168, Wendell Magee, Jr.
It’s much easier for me to just ignore parallels altogether when they’re just glossier, more-heavily foiled, and/or different-colored versions of the regular base set of cards. However, a few times the card companies incorporated enough changes to the parallels to cause me to take note. When that happens, I have to stop and consider whether or not they are worth my attention. Thankfully, Donruss didn’t continue handling parallels in such a matter. It was probably more time intensive and expensive than just adding an extra-high-gloss and some extra gold foil. 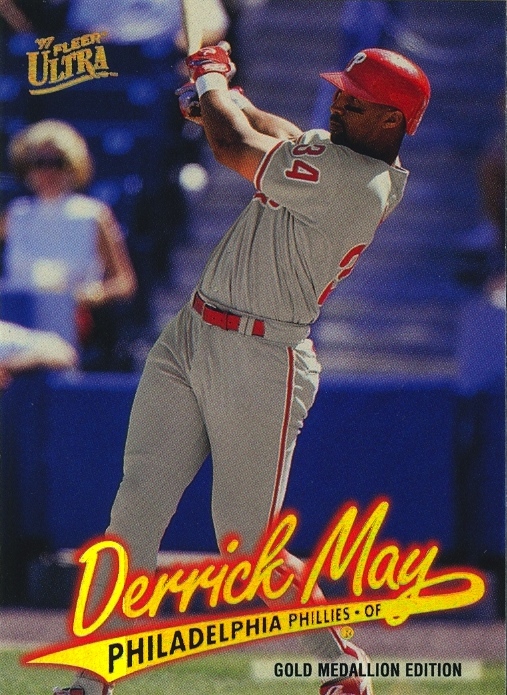 It took another five years before another manufacturer decided to do something really different with its parallels, and when Fleer decided to do so, it did it with a vengeance. The Ultra set went an extra mile that year by using different photos on the Gold Medallion Edition and Platinum Medallion Edition parallels, thus allowing one to argue that they had actually created two sets: the basic Ultra and Ultra Gold (the Platinum parallel used the same photo as the Gold, and all three versions had nearly identical backs). Acquiring these parallels was a no-brainer to me. I absolutely needed to complete the Gold set. 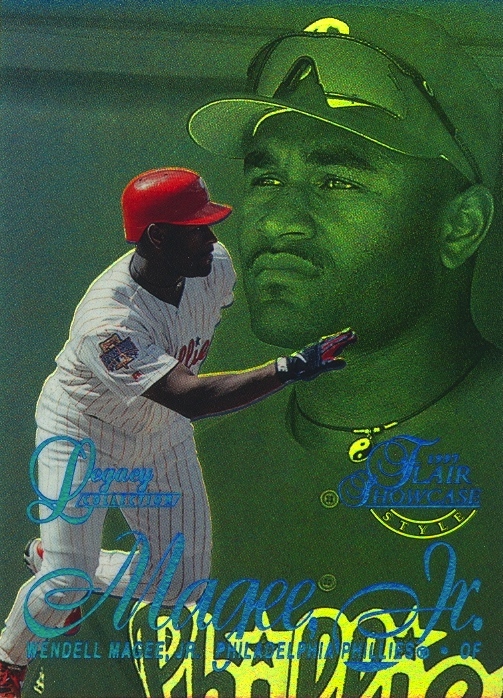 However, Fleer made the job a little more difficult with that year’s Flair set. The set itself employed a form of parallel numbering with three different sets within the set: Showtime (Row 0), Grace (Row 1) and Style (Row 2). 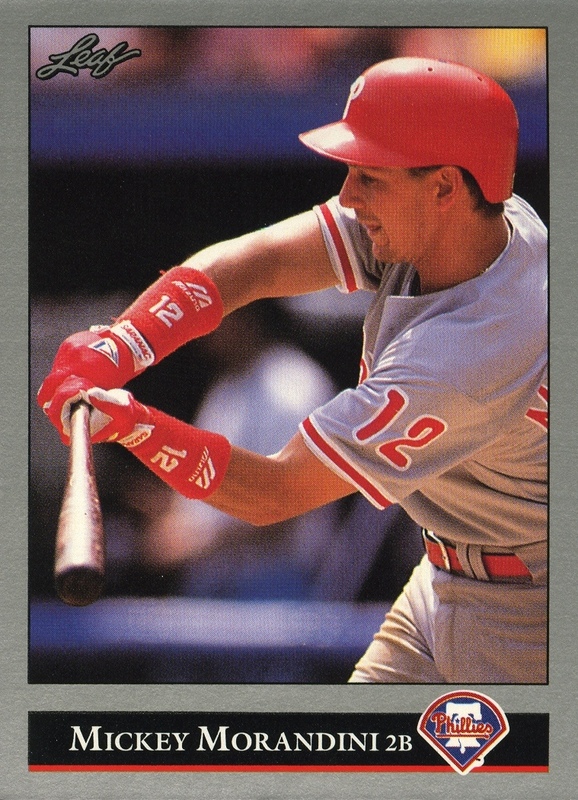 Then to really make sure that you were paying attention, they debuted the Legacy parallels, which if I recall correctly were the first parallels actually serial numbered and printed in quantities of 100 or less. 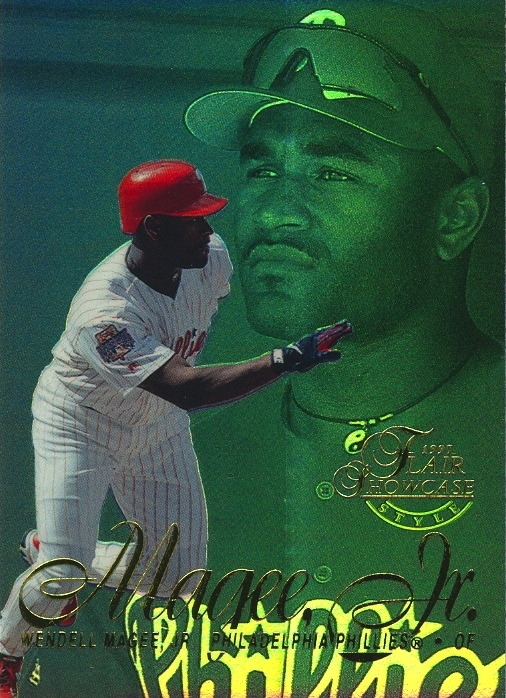 The fronts of the Legacies parallels, which Fleer issued for each row, resorted to the same tricks that the manufacturers employed throughout the decade — i.e., higher gloss and different color of foil. However, the backs used different photos. Again, due to the differing photos, I found myself in the position of feeling like I needed to add them to the collection. Only 1 of 1 Masterpiece” notation on the back. 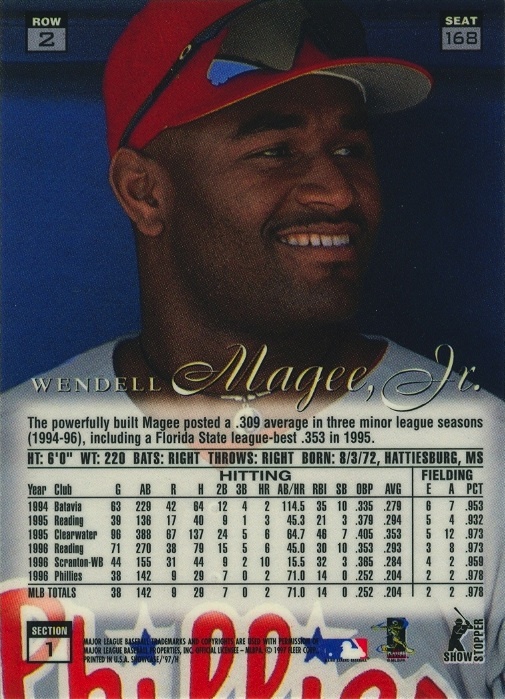 Although I am uncertain of this, everything I’ve read leads me to believe that Fleer did not change the photos on any of the Masterpiece cards. 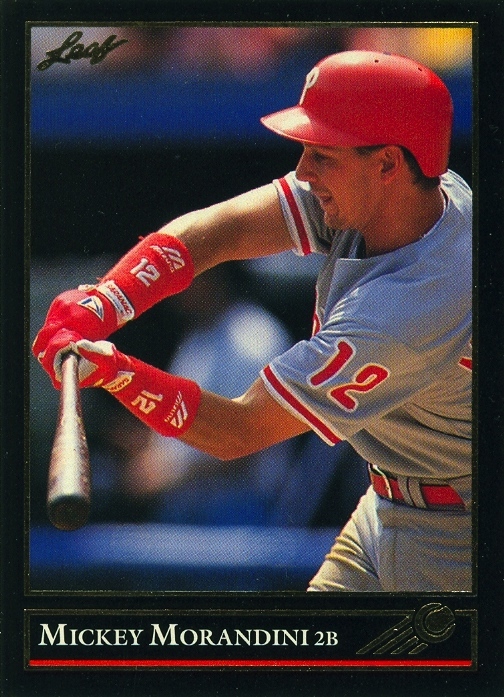 Luckily, it appears that Fleer arrived at the same conclusion that Donruss came to back in 1992: it was just too much work. Although the 1998 edition of Flair resorted to three different rows of sets within the set again, the Legacy cards resorted to the traditional tricks the trade employs for producing parallels. To my knowledge, none of the manufacturers ever again resorted to different pictures for parallel cards. However, for me that hasn’t meant the end of dealing with parallel dilemma. There’s more than enough left to cover in a third installment, which I hope to post sometime this weekend. 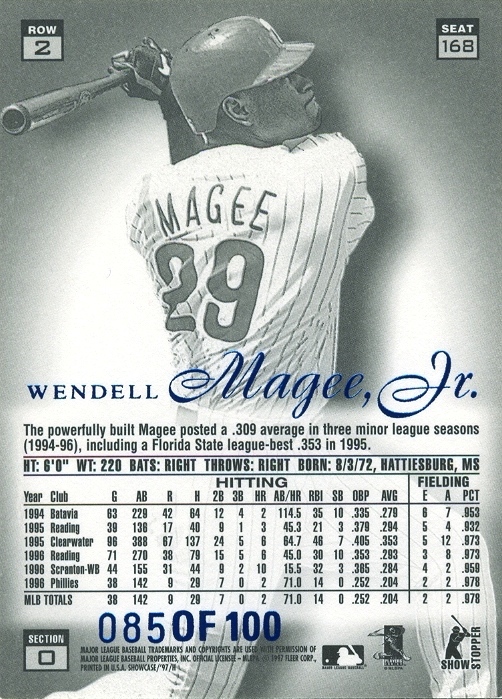 Posted in Derrick May, Mickey Morandini, Wendell Magee Jr.